Those of us with clients that own businesses, highly appreciated stock, commercial or residential investment real estate assets, we often find those clients who are reluctant to sell their asset because of the capital gains taxes associated with the sale. 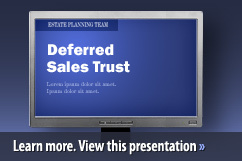 The Estate Planning Team's Deferred Sales Trust™ offers an alternative to a 1031 Exchange to help your client reduce capital gains tax liability or to enable them to sell their property in a down market. This capital gains tax deferral tool could save you thousands of dollars, and by having the opportunity to potentially make a profit on the money you would have paid to Uncle Sam in the year of the sale. Additionally, even in a depressed real estate market, because the client is making money (an interest payment) on the full value of the sale (the sales price) and not the net after tax dollars, your seller clients can reduce their price, SELL NOW, and still make out better over time via proper tax planning with a qualified tax professional. The DST can also be more simply described as a no risk "seller carry-back" financing structure. The process starts with initial due diligence. If the transaction is viable, the trust and property owner will negotiate to reach terms with regard to the asset(s). Then, the property owner would transfer ownership of the property to a dedicated trust. The trust then sells the property, stock or other capital asset to the buyer. Next, the trust "pays" the client with a payment contract called an "installment sales contract." The contract promises to make installment payments to the owner or their trust and those payments can even be structured to continue to future generations with additional estate planning. There are generally minimal taxes to the trust at the time of the sale since the trust often acquires the property from the client for a price that may not be materially different from the sales amount. Should your client choose, they can defer the start date of the principal payments. Your clients may have other income and may not need the payments right away. The tax code does not require payment of the capital gains tax until the seller starts receiving installment payments. The capital gains tax paid to the IRS is only that portion of the capital gains tax due in proportion to the number of years established in the term of the installment agreement. The Deferred Sales Trust™ has the ability to generate substantially more money over the long run than a direct and taxed sale. It is also superior to a direct installment sale as the concerns of a defaulting buyer are eliminated. • Tax Deferral: When appreciated property is sold, tax on gain is deferred until receipt of payments. • Estate Tax Benefits: Accomplishes an estate freeze for estate tax purposes. • Maintains Family Wealth: Helps to maintain wealth within the family. • Estate Liquidity: Converts an illiquid asset into monthly payments. • Retirement Income: provides a stream of income for retirement. • Probate Avoidance: With proper estate planning. For Real Estate Professionals: Set yourself apart from your competition by offering your clients and prospects the DST as a way to defer capital gains. 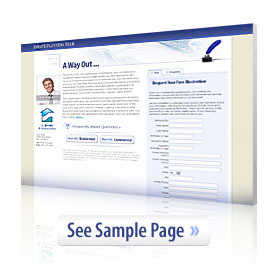 The DST is a valuable marketing tool to increase your high-end listings. For Investment Advisors, RIA'S and insurance agents, banks and financial institutions; the DST is an excellent asset gathering tool. Once the DST is implemented, the trustee can enlist the services of the registered representative or insurance agent to invest the assets. Determining the suitability of implementing a DST with prospective clients also presents opportunities for other types of trusts, estate planning and financial services. 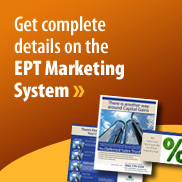 To date EPT"s average case size is $2,200,000,00. EPT members across the country have closed over $1 billion in assets! Join now and start growing your business today!